and Franschhoek itinerary is the one for you. Cape Town is one of the most beautiful and unique cities in the world, boasting a mixture of amazing scenery and wildlife with world class facilities, providing the holiday of a lifetime on this 10 days Pumba, Cape Town and Franschhoek package. In the shadow of the glorious Table Mountain, Cape Town has a host of activities and sights to suit everyone’s taste. The Table Bay Hotel is situated at the V&A Waterfront and consists of over 300 different stylish and fully equipped suites, each coming with either an ocean or a mountain view. Franschhoek is a small countryside village near Cape Town and forms part of the Cape Winelands. Known for the fantastic vineyards that grow there, luxury cheese and olives as well as breathtaking scenery and colonial buildings, this stunning village is post-card perfect. The Franschhoek Country & Villas is a restored 1890’s country house that encapsulates the countryside atmosphere throughout the village. The manor consists of 26 lavish rooms as well as villas each with private patios or balconies overlooking the vineyards. Facilities include two sparkling swimming pools and a world class restaurant. The Pumba Private Game Reserve is a beautiful Big 5 reserve set in the Eastern Cape, which encompasses the best of safari adventure and luxury. The 5-star Water Lodge offers a lavish and stunning, comfortable trip in the African bush and the opportunity to spot the Big 5 in their natural habitat. You’ll go to South Africa . This tour starts in Cape Town (South Africa) & ends in Port Elizabeth (South Africa). You’ll visit Cape Town (City), Franschhoek & Pumba GR (Eastern Cape Parks). Game drives: open-sided 4×4 vehicle. Additional accommodation before and at the end of the tour can be arranged for extra cost. Day 1-4: Table Bay Hotel Luxury+ hotel located in or near Cape Town (Breakfast included). Day 5-6: Franschhoek Country House & Villas Luxury+ hotel located in or near Franschhoek (Breakfast included). Day 7-9: Pumba Water Lodge Luxury+ lodge located inside Pumba GR (All meals included). Day 10: End of tour (no accommodation) Breakfast included. Enjoy a luxury trip, finished off with a perfect safari on this 10 days Pumba, Cape Town and Franschhoek package. Transfer from Cape Town Airport to Table Bay Hotel. Transfer from Table Bay Hotel to Franschhoek Country House and Villas. Transfer from Franschhoek Country House and Villas to Cape Town International Airport. Return transfer Port Elizabeth Airport to Pumba Private Game Reserve. Meals, drinks and activities as stated. Franschhoek is a small, idyllic countryside village near Cape Town, filled with glorious scenery and colonial architecture. Franschhoek is also known for its incredible vineyards where some of South Africa’s finest wines are made – the artisan routes, where you get to sample luxury cheeses, bread, wine and olives is a truly regal experience. The once sleepy little village was named Franschhoek, meaning “French Corner” as it was founded by the French Huguenots who fled Europe and were seeking a secluded hide-out. The Cape Dutch architecture comprises much of the village and remains remarkably well preserved. The town’s proximity to Cape Town allows for pleasant day trips during which visitors can explore the area’s many world-class wine estates and impressive range of excellent restaurants or simply browse the quaint, upmarket boutiques strewn along the town’s lovely tree-lined avenues. Pumba Private Game Reserve, set against the beautiful Eastern Cape landscape, is the perfect destination for a Big Five African Safari. Experience Africa’s wildlife in their natural habitat, from the famous white lion to hippo, hyena, giraffe, wild dog, cheetah, including 21 antelope species and over 250 bird species. Pumba boasts two uniquely different five star luxury lodges – Water Lodge, perched on the banks of the Cariega Lake and Msenge Bush Lodge overlooking the Cariega River floodplain, complete with waterhole and panoramic views of the Zuurberg Mountains. Both lodges offer fully appointed luxury bathrooms, wooden decks, plunge pools and outdoor showers. Cuisine is sublime, being fusion with an Eastern Cape flair complimented by a selection of local wines. Activities include a spa and gym, bass fishing, birding safaris, guided bushwalks and stargazing. Set on Cape Town’s historic V&A waterfront this elegant hotel offers 329 fully air-conditioned rooms, all of which feature views of either the ocean or Table Mountain. The rooms have luxurious walk-in cupboards, marble finishes and writing desks and each is equipped with a butler station and an honour bar. Bathrooms have separate showers and baths. Vanities include a personal hairdryer and a full range of internationally acclaimed cosmetics and toiletries. Hotel facilities include an outdoor pool, an exercise room and a day spa. Cosmopolitan, gracious and relaxed, The Table Bay Hotel is the sum of all that is good about Cape Town. This exclusive boutique hotel is situated on the outskirts of Franschoek in a wonderfully restored manor house and former perfumery dating back to 1890. The hotel offers a world-class on-site restaurant, two pools, and 26 luxury rooms and Villas Suites. Most rooms lead out onto a private balcony or patio with magnificent views of enchanting vineyards and majestic mountains. The Villa Suites are extremely luxurious and boast a fireplace, air-conditioners, 2 balconies, and many more unexpected luxuries. An hour’s drive from Cape Town makes it the perfect getaway for anyone visiting the Western Cape. Pumba Private Game Reserve’s very own Water Lodge provides the perfect balance between an idyllic African safari and true 5-star luxury. Guests of the Water Lodge will be privy to unrivalled views over Lake Kariega, complemented by inviting hospitality and a warm atmosphere. All nestled within the malaria-free province of the Eastern Cape, guests can look forward to spotting the Big 5 (leopards, lions, elephants, buffaloes and rhinoceroses) as well as the free-roaming pride of magnificent White Lions, wild dogs, hyenas and cheetahs. South Africa has a lovely moderate climate that is not too hot and not too cold either, with relatively sunny weather all year round. In-land cities tend to be a lot hotter in summer and a lot colder in winter than the cities along the coast. The temperature in South Africa is measured in Celsius, with an average summer maximum temperature of 28˚C and a minimum of 8˚C; winter temperatures range anywhere from 1˚C to 18˚C. Coastal cities have a sub-tropical climate while in-land is drier. High mountain ranges are prone to snow, and very rare instances snowfall in cities has been reported. Autumn and spring tend to be South Africa’s rainy seasons with the Western Cape receiving more rain than most other provinces. Upon arrival, guests will transfer to the 4 star Table Bay Hotel, where they will spend their first three nights. The Table Bay Hotel is magnificent, straddling the antique breakwater with a style that is both innovative and entirely in keeping with its surroundings. Its contemporary architectural treasure, its design and execution are the result of trans-continental co-operation. The Table Bay Hotel has a total of 329 fully air-conditioned rooms which include luxury rooms, superior luxury rooms and suites. The rooms have luxurious walk-in cupboards, marble finishes and writing desks. In-room dining is offered 24 hours. After breakfast, guests can spend their day lounging around the heated oxygenated outdoor swimming pool, shopping at the V&A Waterfront, or burning up a sweat at our in-house gym. Spa treatments are available at the Bay Hotel Camelot Spa as well as one of a kind meals from the Camissa Brassiere. Cape Town is also home to many wold-renowned golf courses. Guests will transfer from Table Bay Hotel to the 4-Star Franschoek Country House and Villas. This exclusive boutique hotel is situated on the outskirts of Franschoek in a wonderfully restored manor house and former perfumery dating back to 1890. Most rooms lead out onto a private balcony or patio with magnificent views of enchanting vineyards and majestic mountains. 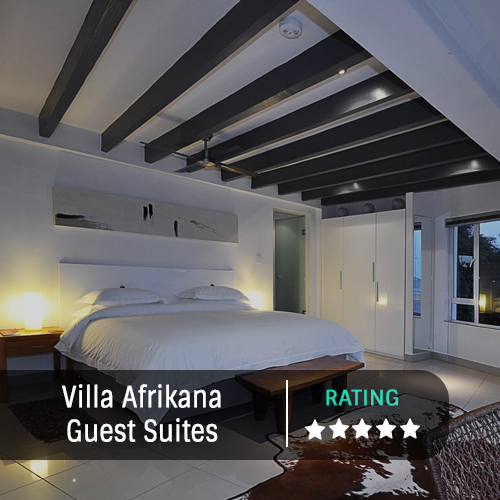 The Villa Suites are extremely luxurious and boast a fireplace, air-conditioners, 2 balconies, and many more unexpected luxuries. An hour’s drive from Cape Town makes it the perfect getaway for anyone visiting the Western Cape. After Breakfast, guests can take full advantage of the hotels world-class on-site restaurant and two pools. Guests can spend a day visiting the beaches or taking a trip to Hermanus, Cape Town or the surrounding area. Guests transfer from Franschoek Country House and Villas to Pumba Water Lodge where they spend the night. Pumba Private Game Reserve’s very own Water Lodge provides the perfect balance between an idyllic African safari and true 5-star luxury. Guests of the Water Lodge will be privy to unrivaled views over Lake Kariega, complemented by inviting hospitality and a warm atmosphere. All Chalets open onto private game viewing decks boasting plunge pools and outdoor showers. The indulgent bathrooms offer free-standing tubs and double basins, and each room is fitted with an earthenware fireplace. While on a day safari, guests can look forward to spotting the Big 5 as well as the free-roaming pride of magnificent white lions, wild dogs, hyenas and cheetahs. The lodge also offers safari yoga retreats and world class spa treatments such as massages, full body wraps and hot stone therapy. Guests will end their journey at the Pumba Game Reserve and make their way home.